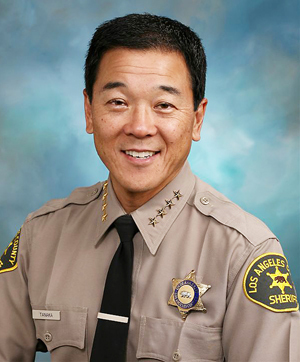 The jury deliberated for two hours and found ex-Undersheriff Paul Tanaka guilty on charges of conspiracy and obstruction of justice for his alleged role in a scheme that’s already led to the convictions or guilty pleas of nine other Los Angeles County Sheriff’s Department officials. Tanaka, 57, is in the final stretch of a corruption trial that could send him to federal prison for a maximum of fifteen years. In 2014 HMG-CN interviewed Tanaka below is the article. 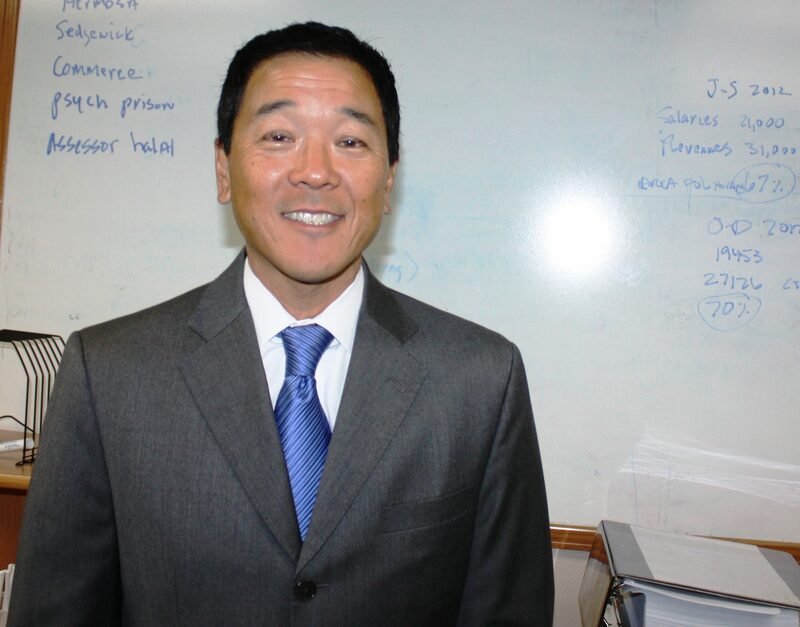 Paul Tanaka, candidate for Los Angeles County Sheriff during his visit and interview in 2014 at Hews Media Group-Community Newspaper office in Cerritos. After dedicating three decades of my life to public safety, I have suffered overwhelming character attacks over the last two years by nameless “sources” who have continuously falsified accounts of my behavior and my leadership for their own self-purpose and notoriety. I have always believed that the focus of law enforcement officials should remain on public safety and the community rather than combating the latest news story, however, I can no longer remain quiet as others continue to paint fiction and call it truth. I would like to Set the Record Straight regarding my character and my record once and for all. First and foremost, during my 33 years in law enforcement I have never condoned nor encouraged excessive force or deputy misconduct. In fact, in the past I have been highlighted as a strict no-nonsense disciplinarian. It wasn’t until there were talks throughout the Department that I may run for Sheriff that these accusations began. Many of my accusers feared the standard of accountability they would be held to should I become Sheriff. Throughout my career, I have always demanded our Department employees, particularly high-ranking executives, perform the duties and tasks the people of Los Angeles County pay them for, and expect from us, with no exception. Some of my strongest attacks come from the Citizen’s Commission on Jail Violence regarding excessive force in the jails. In the report, the Commission claims that I encouraged a culture of violence in the jails, which led to deputies breaking the law and using excessive force on inmates. Although the Commission made some worthy recommendations for jail reform, including the installation of cameras throughout jail dorms/hallways and the implementation of a third-party Inspector General, I fundamentally disagree with the Commission’s findings as they pertain to me and my character for a variety of reasons. First, during the period of time the investigation into the Men’s Central Jail took place (2008-2010), I was not in charge of the jails but was Assistant Sheriff in charge of Patrol, Detective Division, Homeland Security and the Department’s multi-billion dollar budget. I had zero command over the jails. Second, those who spoke against my character before the Commission weren’t under oath and were not cross-examined; meaning there was no attempt by the Commission to determine if those individuals were telling the truth. Lastly, those who had direct command over the jails during that time, Chief Dennis Burns and Assistant Sheriff Mark Cavanaugh, never appeared before the Commission to explain their lack of leadership or involvement in the mismanagement of jail deputies. Furthermore, an online publication has written countless stories about a secret patio that was supposedly reserved for a secret circle of department employees that had to possess “challenge coins” in order to gain entrance. In addition, this same publication has also alleged that those who donated to my Mayoral campaign would then be promoted in the Department. First, the process for promotion in the Sheriff¹s Department is an uncompromising and strictly defined process. Promotions are based on a set of qualifications determined by the Department and the County. In addition, promotions to Lieutenant and higher were appointed solely by the Sheriff. No one who has ever donated to my City Council campaign has ever been given special treatment. Period. Second, the employee patio that was mentioned is an open air, out-door patio with poles that support its roof. It is open to all civilian and sworn employees and was commonly used for cigarette breaks, barbecues, meetings, etc. The coins they referred to were created, passed out and sold by Chief Buddy Goldman and retired Captain Joe Gonzales. To my knowledge, they were nothing more than a souvenir item anyone in the department could obtain. Lastly, and perhaps most important, is my involvement in the Anthony Brown case. When the indictments were first released, I refrained from going into details about my involvement because the investigation is ongoing, and out of respect for the process, I believed these matters should be handled in the courts and not in the press. In addition, because of the ongoing nature of these matters, I have been told that I will be subpoenaed as a witness in the upcoming obstruction trial and therefore think it is inappropriate for me to make further public statements on this matter. However, after multiple attacks by opponents and media outlets who have used my silence out of respect for the process as an admission of guilt, I will once again reiterate what I can. I have been interviewed by the FBI and I have testified before the grand jury regarding my knowledge and involvement in this matter. That being said, with regard to inmate Anthony Brown, the Sheriff made two broad directives to ensure the safety of Brown and to investigate the smuggling of a cellphone into the jails. Both of which were direct orders and, to my knowledge, were made in good faith and were not illegal. While I was involved in some aspects of the implementation of these orders, I was not involved in, nor had knowledge of other aspects and my name was sometimes used without my knowledge or consent because of my position. I hope these facts clarified some of the noise that has been generated about my character and history. I have served the people of Los Angeles County for 33 years as a public safety official. During that time, I led the department’s War on Gangs, successfully managed the department’s multi-billion dollar budget for more than a decade and decreased crime throughout the county. In addition as the Mayor of Gardena, with the help of my colleagues on the dais, I took a city with a five million dollar deficit and turned it into a 10 million dollar surplus. Gardena has also experienced its lowest crime rates in over 50 years, particularly violent crime. In addition, our city’s economic vitality has soared throughout the course of my leadership. I have dedicated my life to serving others and I look forward to doing so as Sheriff of Los Angeles County.